The ATI Radeon HD 5970 slaughters the competition in pretty much every benchmark thrown at it. It's outrageously fast. We're talking five teraflops here, people. Teraflops. MaximumPC put the 5970 to the test, and found that it lives up to its promise. 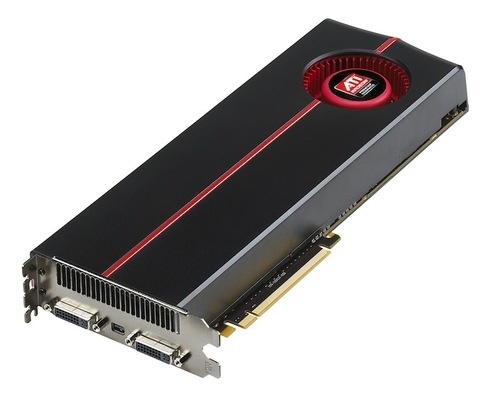 The 2GB dual-GPU card is the first to support DirectX 11, and basically doubles its wholly respectable predecessor (the 5870) in specs, capable of delivering nearly 5 teraflops of raw processing power. It's a massive card, about a foot long, designed mostly for heat dissipation, at which aim it apparently succeeds. It's also got easy access to overclocking via AMD's OverDrive, and can drive up to three displays simultaneously with a maximum resolution of 7680x1600. So it's pretty much the greatest thing ever, and it's got a pricetag to match: $600 upon its undisclosed release.